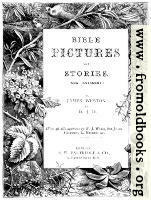 Pictures from Bible Pictures and Stories (New Testament), by D.J.D, with illustrations by W. J. Webb, L. Huard and others. I have the fourth edition; an inscription on the inside of the front cover is dated 1892. 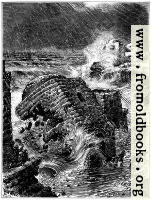 There are two books in one, Old and New testament respectively, with a second title page and contents. W. J. Webb (really William James Webbe) was influencd by Holman Hunt and the pre-raphaelites. Published by: S. W. Partridge & Co. The House Built upon the Sand.